I dropped my laptop and when i turnned it on it keeps saying error loading operating system, help! how far did you drop it from? can you get into bios (press either f2 or del during boot up) if so is your HD detected there? Well i dropped it off my bed so about half a metre. I possiblily could have an but i couldn't use it anyways as i can get passed the error loading system. I pressed f2 and the BIOS setup utility appears what do i do now?? I have this same problem! I dropped my laptop flat at a height of about 1 foot or so. I get this when I try to boot up. Any help will be greatly thankful. Edited by lawnman, 06 December 2006 - 10:42 AM. Also I do not have a boot disc! or a warranty. 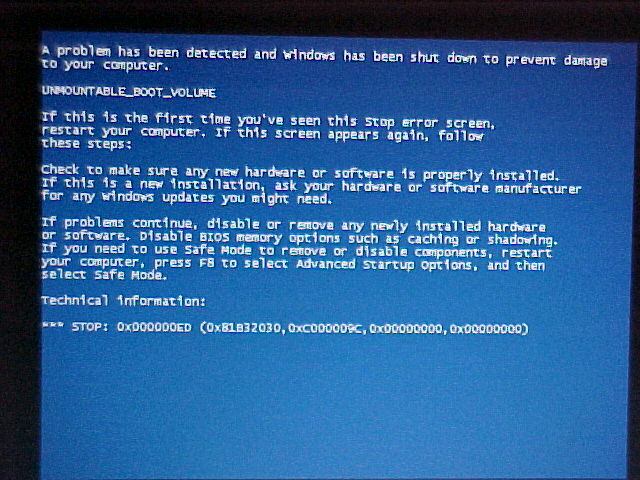 I bought this laptop off ebay and its been a good one till I dropped it. It is a dell inspiron 4100 if that helps any!! Edited by happyrck, 06 December 2006 - 11:27 AM. Edited by happyrck, 06 December 2006 - 12:00 PM. OK I did that and it said that the memory had changed and I proceeded. And in the end I still get the same result. I even tried it several times to be sure. Any other suggestions? It acts like its going to boot up, the windows symbol comes up and then the blue screen and the computer starts rebooting on its on. Would it boot up if I had a cd to boot with? Yes I have tried everything and I finally just took the laptop to a repair shop and they had a harddrive that he could try in mine. It will boot up with the replacement hard drive but there still seems to be something wrong with the memory. I am going to order a new harddrive and possibly new memory cards and do the work myself. Now my question now is How large of a harddrive can I use in my laptop? and what would be the recomended memory if and when I replace the memory? My harddrive now is 20gb and memory is 2 at 128mb. your best bet would be to go to the manufactures website and in their support section or contacts...look for a phone number and find out what your model will support..